Waterford's House of Industry, to which was attached a lunatic asylum, was erected in 1779, at a cost of £1500. Its board of governors, which met on the first Thursday of every month, rejoiced in the title of "the President and Assistants instituted for the relief of the poor, and for punishing vagabonds and sturdy beggars for the county and county of the city of Waterford." An average of 200 to 300 paupers were received each year and were occupied in domestic chores and in various trades. A school for the instruction of girls was also provided. Paid staff included an apothecary, a superintendent, and two housekeepers. Two physicians, a Roman Catholic priest, and a Protestant minister attended without charge. Co. Waterford: Ballynakill, Croom, Drumcannon, Dunhill, Faithlegg, Island Keane, Kilbarrymeadon, Kilburn, Kilmaclegue, Kilmeadon, Newcastle, Rathmoylan, Reisk, Rosmire, Waterford (10). Co. Kilkenny: Aglish, Dunkit, Kilbeacon, Kilbride, Kilcollum, Killahy, Kilkeasy, Kilmacon, Rathpatrtick, Rathkeeran. The Board also included 11 ex-officio Guardians, making a total of 45. The Guardians met each week on Wednesday at 11am. The population falling within the Union at the 1831 census had been 79,694 with divisions ranging in size from Rathmoylan (population 1,074) to Waterford itself (28,821). The new workhouse, built in 1839-41, was designed by George Wilkinson on an six-acre site on the east side of John's Hill to the south of the city. It was designed to hold 900 inmates, cost £7,850 plus £1,577 for fixtures and fittings etc. It was declared fit for the admission of paupers on 15th March 1841 and admitted its first inmates on the 20th April. The site location and layout are shown on the 1907 map below. A central block housed dormitories, school rooms, day rooms, kitchen and food serving rooms. The rearmost block housed the workhouse infirmary. At the end of 1846, as a result of the potato famine, the workhouse had become overcrowded and disease-ridden. Two hundred extra places were created through the erection of sleeping galleries and shed. A number of auxiliary workhouses were also opened in the city. These included a Presentation Convent, a tanyard, a malthouse, four stores and two other buildings that were temporarily rented for the purpose. The workhouse made particular use of two other nearby institutions — the Waterford County and City Infirmary, and the Fever Hospital, both also on St John's Hill to the north. The Infirmary was founded in 1785 from a fund formerly used to support a medieval leper hospital, by then closed-down due to a lack of leprosy cases. 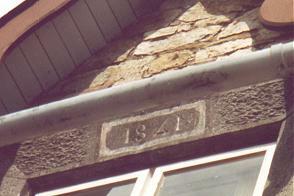 However, the new Infirmary was also known as the Leper Hospital until 1896. 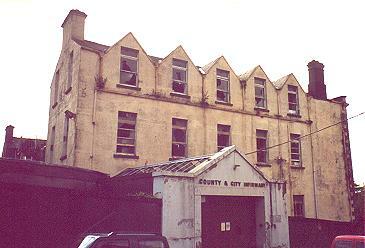 Waterford County and City Infirmary, 2000. 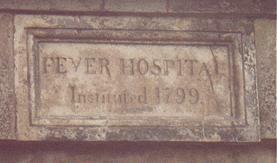 The Fever Hospital, built next door to the Infirmary in 1799, was the first of its kind in Ireland. Waterford Fever Hospital Site, 2000. In 1847, at the height of the famine, the Fever Hospital could not cope and a timber shed was built in the Infirmary grounds to act as a temporary fever hospital, primarily for workhouse inmates. The following year, this and other temporary fever sheds in the city and county were closed. With the onset of a cholera epidemic in 1849, the Infirmary's trustees gave over part of the hospital building to house cholera patients, provided that the workhouse guardians 'removed the abandoned and unsightly fever shed'. In the 1850s an inspector from the Board of Education visited a number of workhouse schools and reported terrible conditions. In Waterford, a boy of fifteen leaped on a school desk and broke it - he was charged and sent to jail for six weeks with hard labour on the treadmill. Some other boys wet their beds at night, the next day they were taken to the pump, stripped and publicly pumped on. In September 1876, medical care in the workhouse passed to the Sisters of Mercy, a religious order dedicated to the relief of the sick poor through their training as nurses. Initially, Waterford operated as a branch house of the Sisters' Clonakilty community, then in 1883 came under the aegis of their new foundation in Dunmore-East. In September of that year, the then presiding Sister of the workhouse, Sister M. Catherine O'Brien, was nominated to take on the post of matron of the hospital following the death of the previous incumbent. The Sisters taught the workhouse inmates various skills and trades — needlecraft and lace-making for the women, and (with the paid help of skilled craftsmen) cobbling and carpentry for the men. They also set up a special unit for unmarried mothers who kept their children in the workhouse, and separate schools for boys and girls. At the 1901 census, the population of the Union was 48,091 with 42 officials and 732 inmates in the workhouse. Following the creation of the Irish Free State in 1921, the workhouse became St Patrick's County Hospital, with poor relief assigned to the County Home in Dungarvan. An extensive modernisation of St Patrick's Hospital was undertaken in 1948. Since 1958 the hospital has focused on geriatric care. The front block served as the city's Register Office for a number of years, but at the time of writing was in use as offices from a drugs rehabilitation service. The nearby Fever Hospital was demolished in the 1970s. 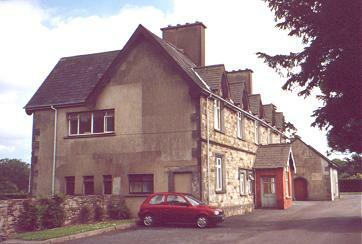 The County and City Infirmary remained in use until the early 1980s and is now awaiting redevelopment. Waterford County Archive Service, Dungarvan Central Library, Davitt's Quay, Dungarvan, Co. Waterford. Holdings include Board of Guardians minute books (1843-1919) etc. Detailed description of surviving records.